Besides a natural telepathy with each other, their senses are acute. Especially scent. Especially for food. Grain is the main draw, anytime, but hay must be fresh. If it’s fallen onto the ground and they step on it, well then … no longer edible. It smells like sheep feet and they ignore it. If mimosa is cut on the far side of the pasture, they know it and come running. If grain is hidden in a closed bag where they might find access to it, they will find it. Immediately! Such as the time Ivy entered an unfamiliar classroom with me, and no sooner through the door, whipped the leash out of my hand and charged for the hamster grain at the back of the room, chowing down before I could reach her. Other senses are just as strong. Sound carries all around from the neighbors’ dogs or an overhead plane to my call from two acres away. All make their ears twitch and their heads turn. An amazing example is when the shearer comes, who rumbles down the dirt road in a cloud of dust, in an old pick-up. This man appears only once per year, with a definitive engine sound the sheep remember. At his approach from almost a quarter mile away, I’ve seen their heads jerk up, all eyes turn as one, and all focus together towards the road. They know who it is! And what’s coming. And they don’t like it. Sight might not be at the top of the list, but they are very sensitive to movement. In the distance, if an unclear object moves within their near vicinity, such as another animal approaching through tall moving grasses, or a bird who flies overhead, ears will twitch, eyes will turn, all as one. Colors are not the same as ours and studies have shown a limited range – mostly in the reddish/yellowish shades. My previous dog – large and red, could jump the fence into their pasture. In the YarnTalk stories, since the sheep did not know his name, they imagined he was called “Big Arf”. 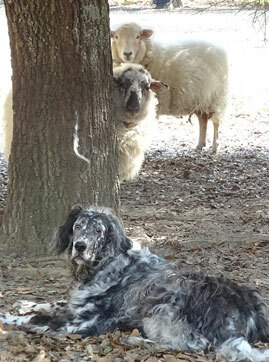 Big Arf usually ignored the sheep and would explore the far corners of the pasture, stick his nose deep into old woodpiles, and bury his bones in forgotten holes under the trees. Wherever he moved, the sheep’s eyes and ears and noses would follow, raising their heads as one, pointing in his direction like a weathervane. Whenever I looked for him, I looked at them pointing the way. I called them the “Arfvane”. Sheep have no natural defenses and must stay on top of their game to deal with predators. Their only shield is to run away, or hide. Even rams, protector of the flock, are no match for a dog, or coyote, or an angry snake. Their main “defense” is a good fence. But being hyper-aware is something to be proud of. Previous PostRule #2: Stick With the FlockNext PostRule #4: Not Too Close!